Logins this hour: 5582 ? Enter vacation and other time off requests like any other rotation assignment on a block schedule. Or use Amion's special request tool to manage and track your resident's vacation and work requests. You may enter your residents' special requests for them in OnCall or have the residents submit their requests online at Amion.com. 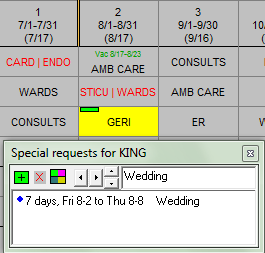 Have special requests display in your schedules. Click on View in the menu toolbar and select Special Requests. Select a resident's name on left hand side of block schedule. In the Infobox select Requests... Alternatively, place your cursor in the cell that spans the dates for the special requests. Right-click on the highlighted block. Select Add a request… from the menu options. The Special Requests setup box appears. Click the + icon to add a request. Type the special request in the text field. The date for your new request is displayed. Select the end date of the special request by using the up and down arrows. If you need to change the start date, use the left and right arrows. 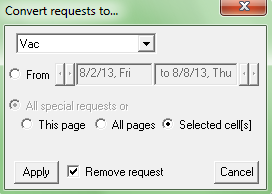 When entering special requests, the request bar in the color selected will appear at the top of the block cell. Hover over the request bar with your cursor to see special request details. Right-click on the bar and select convert request to.. from the menu options. The Convert Request box appears with converting to "Vac” (Vacation) as the default. You may convert to a different rotation by selecting the drop-down selector box at top left corner. The requested dates appear. You may alter the dates by using the left and right arrows both before and after the dates. Decide if you want to remove the colored request bars once converted or keep the requests for future reference. If you want to remove the request bars, select the option at the bottom, “Remove request.” Click Apply to convert the request. The Convert Request box will close. And you’ll see “Vac” entered as green sub-text at the top of the cell with the dates. Double-click on a colored request bar to automatically convert the next special request to "Vac." If wanting to grant all requests at once, in the Convert Request box, hold CTRL and click "Apply". Here we discuss requests. This page describes vacation.